Benedict “Dinky” de Borja has been a volunteer Firefighter and EMR for the Pateros Filipino-Chinese Volunteer Fire and Rescue Brigade for the last 5 years. He helps Dr. Sixto Carlos on topics such as Emergency and Disaster Preparedness, as well as First Aid. This article has been created after the intense typhoons that hit Philippines in 2013 and 2014. The following guidelines are suitable for each country around the world and are a good support to act in time in case of quakes, floods and simply feeling prepared in necessity. Want to know how to prepare an emergency kit for your family in case of need? Discover how! As an active fire & rescue volunteer I was one of the first to be deployed when Tropical Storm Ondoy hit Metro Manila in September of 2009. Ironically, my first “patient” was a small Yorkshire terrier in a panic stricken mode as floods were steadily rising in their home. Throughout most of that ordeal and the days that followed after that both people and their pets were separated or stranded where they were and food and help had to be brought to them to see them through till Ondoy has passed. The story I’ve just written is true and highlights the need for pet owners to take more responsibility for their beloved companions. As more and more access to information becomes available pet owners now have the means needed to take care of their pets not just during good times but during times when an emergency happens or when a disaster is threatening to occur. Preparedness can be approached in two main categories. That is emergency preparedness or disaster preparedness. Although many times you may read or see that in a lot of instances these two are often interchanged. But for the sake of this article let us define Emergency Preparedness as addressing instances such as common household emergencies to events that affect your immediate family while Disaster Preparedness deals more with Natural and Manmade disasters affecting more people in a wider area such as a community, province, or region. Pets are not a high priority when it comes to rescue or evacuation during emergencies or disasters. If you were to evacuate not many evacuation centers would allow pets as they would pose a health and safety risk to other evacuees in the shelter. Food, Water, and Medicine will be very hard to find in a disaster scenario. While this may be true it is also a fact that there are more pet owners now than before. Just strolling around a mall on a lazy Sunday afternoon one can see the many different pet owners (although mostly dogs) strolling around with their furry little (and sometimes big) companions. This means there are more people with pets that need to make sure that in an emergency or disaster they have the immediate resources and knowledge needed to make sure that their pet will be taken care of. In both emergencies and disaster events the items mentioned above must be present in your kits. The scope and scale of what the kits can do are what makes the difference. For example, in an emergency situation the water you’ve packed would be enough to give your pet a drink or to clean a wound. In a disaster scenario that logic also holds true but the amount of water you have allocated is enough to last at least 3 days to a week and should include enough for drinking, cleaning, and other needs for your pet. (NOTE: In the Philippine setting it is advised that standard preparedness kits hold enough supplies for at least a week). Food is another standard preparedness item and should include both wet (Canned) food as well as dry food for your pet. Please take note that the food you set aside for your pet must be varieties, brands, and flavors that they are familiar with so that nothing is wasted. Although food may not really seem much in the event of an emergency it does have a calming effect on your pet when they need to be distracted. For disasters it serves the same purpose only here you need to prepare enough food for a week as help may take that long to get to you. Shelter is a matter that depends on the situation you find yourself in. In an emergency, shelter can be a simple pet carrier, box, or vehicle for your pet to temporarily stay in. While in a disaster, shelter can be your vehicle or evacuation shelter. Make sure that in both cases always have provisions for hygiene and sanitation such as a litter box or a ways to dispose of droppings. First Aid and Medications are pretty much self-explanatory what they’re for. The difference being in common emergencies the goal of first aid is to treat common ailments and injuries in preparation for your pet to be taken to more advance veterinary facilities for more comprehensive treatment. In a disaster scenario you may not be able to simply take your pet to the vet clinic and you may have to play that role until help or rescue arrives. Pet ID and documentation are very, very important in any scenario. Pet IDs can be dog tags, tattoos, or microchips surgically imbedded under your pet’s skin. If you have multiple pets taking current pictures of them can help especially if you take a picture of identifying marks such as unique fur patterns and birthmarks. Pictures of you and your pet together can establish rightful ownership when you and your pet are separated. Finally, make sure to have some of your pet’s favorite toys available to them. This will serve the same purpose as food as it helps to distract your pet and keep them occupied. 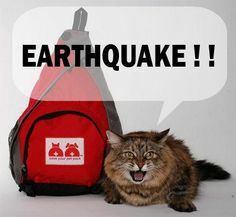 This is especially helpful when you are evacuating in a disaster or your pet will be sheltered with other animals and may be stressed out by their presence. A small ball or chew toy or even some squeaky rubber mouse can help keep you and your pet distracted as you wait for the emergency or disaster to pass.